Home » Android , Apple , Mobile , Versus » iPhone 6S Plus VS Samsung Galaxy S7 Edge – Who's Better? 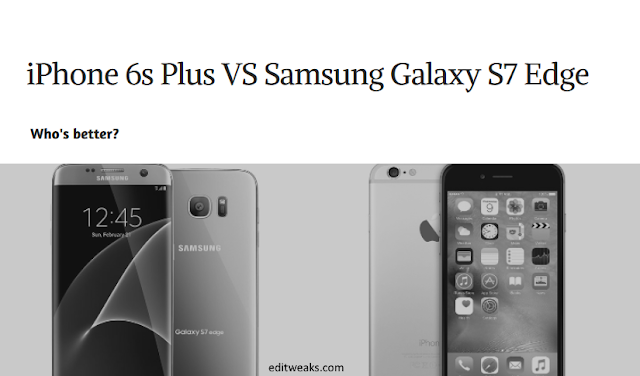 iPhone 6S Plus VS Samsung Galaxy S7 Edge – Who's Better? Last year, the iPhone 6S and 6S Plus were released, and Apple fanboys were all heated up, especially about the iPhone 6S, claiming it's the device of the century and all. Now, early this year, Apple's biggest rivals Samsung dropped the Samsung Galaxy S7 and S7 Edge and it was the turn of Android fanboys to shout the roof down, singing praises of both Galaxy S7 variants to whoever cared to give an ear. In a nutshell, both devices are great, and both excel in features and performance. But as in all situations, one is always better than another right?. It is very hard to judge which is the better one between the current top flagships from the top smartphone manufacturers in the world, and it's practically impossible to say which is the overall best. In our comparison between the Samsung Galaxy S7 Edge and the iPhone 6S Plus today, we'll be comparing the performance of both devices in different areas and specifications, with picture proofs where necessary. If you're an Android fanboy and you're reading this post eagerly waiting for us to destroy the iPhone 6S (with the pen of course, since it's mightier than the sword :) ), you might want to hit the back button. Same goes to all iPhone or Apple fanboys. We are going to compare both devices fairly and based on real life tests and experiences. Apple iPhones have always been loved by their superior designs, and the premium look it possesses and gives its users. However, from the Samsung Galaxy S6 and S6 Edge, Samsung has started producing its flagship phones with designs good enough to match that of the iPhone, and the Samsung Galaxy S7 Edge has been described as sexier than the iPhone 6S Plus. Looking at the specs, the S7 Edge is made from glass and aluminum, the front screen and back of the phones sporting curved glass designs. This gives the phone a more classy look, but the fact that the glass on the Galaxy S7 Edge tends to accumulate fingerprints a lot is enough to scare some people off it, especially the germaphobes. Should you mistakenly break the glass on the S7 Edge, it is very expensive to replace. The iPhone 6S Plus is made purely from aluminum and is designed in the way iPhones have always been designed, with some minor tweaks in the design. That said, the iPhone is still a good-looking design, and some will actually prefer its looks to those of the Samsung Galaxy S7 Edge. Both devices have screens 5.5 inches wide, but in dimensions, the S7 Edge is smaller and more handy to the touch at a dimension of 151 x 73 x 7.7mm. The iPhone 6S Plus is quite massive, at a dimension of 158 x 78 x 7.3mm, thanks to its smaller bezels. The iPhone 6S Plus is the weightier of the two, at 192 grams. Combine that with the wider display, you get a slightly bulkier classy flagship. The Samsung Galaxy S7 Edge once again excels here, at just 157 grams. Coming to the screen internals, the Galaxy S7 Edge has an AMOLED display with display resolution of 2560 x 1440 (Quad HD/QHD) pixels and pixel density of 534ppi, while the iPhone 6S Plus has an IPS LCD display with display resolution of 1920 x 1080 (Full HD/FHD) pixels and pixel density of 401ppi. The S7 Edge's display is 33 percent sharper from the specifications, but the Apple iPhones have been known to exceed just paper specifications. Under the hood, the Samsung Galaxy S7 Edge comes with a quad-core Qualcomm Snapdragon 820 processor with processing speeds of up to 2.1 GHz, while the iPhone 6S Plus comes with Apple's own A9 Processor with dual cores and processing speeds of 1.84 GHz. Though the specs suggests that the S7 Edge has a better processor, iPhones are well renowned for their efficient RAM management in the face of Samsung's formerly crappy Touchwiz RAM management, so it's hard to off-handedly say which processor is better. However, in graphics and benchmark tests conducted repeatedly, the Samsung Galaxy S7 Edge processor has been shown to beat the iPhone 6S Plus' processor. Another plus for the edgy phone. The Galaxy S7 Edge comes with 4GB of RAM, which is double that of the iPhone 6S Plus. Again, this doesn't really matter as the iPhone has much better memory management than any other smartphone. With the Samsung Galaxy S7 Edge, you have the option of only 32GB of storage in the U.S. and 32GB, 64GB and 128GB outside the U.S. There is also the option to expand the internal memory with an external memory card. The iPhone 6S Plus offers 16GB, 64GB and 128GB of internal memory, however with no option of expansion. Overall, both devices perform well enough, with the S7 Edge better in magnitude of specs and the 6S Plus performing really well in real time situations. The Samsung Galaxy S7 Edge runs Android 6.0 Marshmallow out of the box, with the Samsung's heavily-customized version of Android Touchwiz, as usual. Touchwiz has had pretty bad criticisms and reviews since its release, but not many have been able to fault the version of Touchwiz that came with the Samsung Galaxy S7 Edge, mainly to the fact that it has been refined and RAM management and general operations on the custom UI have been greatly improved. The iPhone 6S Plus, which was released in 2015, ran iOS 9 out of the box, with its users gearing up for iOS 10, just as Android users are anticipating Nougat. Both software versions perform exceedingly well, each packing its own features, some similar, some different. The iPhone 6S Plus comes with 3D Touch, which is absent on the S7 Edge, and the S7 Edge offers a lot of customizations with Touchwiz, which the iPhone doesn't offer. The Samsung Galaxy S7 Edge and the iPhone 6S Plus come with fingerprint scanners, located in the same place -- the home button -- and with similar performance speeds. It is said that the iPhone's fingerprint scanner requires a shorter validation time, but longer on-screen unlock time due to animations, and the S7 Edge requires a longer validation time and shorter on-screen unlock time. Both devices have a single speaker on the bottom of the devices, and, as usual, a charging point at the middle of the bottom of the devices. The Samsung device's charging port is a micro-USB port, while that of the iPhone is a lightning port, the difference being that the iPhone's charging cable is reversible. The Samsung Galaxy S7 Edge has an IP68 rating, which means that it can be submerged in up to 1.5 metres of water for up to 30 minutes. The iPhone, though doesn't have this capability. The camera on the Samsung Galaxy S7 Edge has been hyped very high, much due to its excellent performance in low-light conditions. Both smartphones come with Optical image Stability (OIS) and 4k video recording. The apertures on both phones' cameras are different, though, with the S7 Edge's camera having a larger f/1.7 aperture, and the 6S Plus having a smaller f/2.2 aperture. Practically, the two phones' camera perform really well in normal light situations, with the iPhone 6S Plus' camera producing softer, darker images with less contrast, and the Galaxy S7 Edge's camera producing more sharper and vibrantly-colored images with more contrast. Invariably, the Samsung Galaxy S7 Edge's camera performs better than the iPhone 6S Plus in low-light conditions, and this has been confirmed over and over again in various tests and camera shots. The iPhone 6S Plus comes with a smaller 2,915mAh battery, while the S7 Edge has a 3,600mAh battery. IPhones have always been known for their not-too-large choice of batteries, and a lot of iPhone users say that this doesn't necessarily mean a shorter usage time, since iPhones are very good in software and hardware blending. The S7 Edge's battery, though, has been confirmed to be better then the 6S Plus' battery in terms of usage time. The Samsung Galaxy S7 Edge comes with Qualcomm's Quick Charge technology, which allows you to charge the device from 0 to 100 percent in about 75 minutes, compared to the iPhone 6S Plus that doesn't have fast-charge and takes almost 2 hours to charge fully. The Samsung Galaxy S7 Edge further beats the iPhone 6S Plus hands down with its wireless charging capabilities. The iPhone is incapable of wireless charging, mainly because of its all-metal design. Currently only the 32GB is available in Nigeria at N275,500 on Jumia Nigeria HERE. Overall, considering all the points above, my professional verdict on this matter is that the Samsung Galaxy S7 Edge is better, though slightly, than the iPhone 6S Plus. We're looking forward to what the iPhone 7 and Samsung Galaxy Note 7 will bring to the table this year.